Maybe you truly need to be from Northeast Ohio to get this LeBron “thing”—Local high school star makes cover of Sports Illustrated and is already anointed as the “Chosen One.” He goes on to win two state titles, then bypasses college to become the consensus NBA #1 draft pick as an 18-year-old. As he watches the planets align he drops into the lap of his local Cleveland Cavs to save the lowly franchise and bring Cleveland their first World Championship in any major sport since 1964. At least that was the plan. It would take somebody like Scott Raab, born and bred in Cleveland, to be able to write a book like The Whore of Akron. Now transplanted to New Jersey as a long time writer for Esquire, Raab grew up a rabid Cleveland sports fan and always carried with him a ticket stub from the Browns World Championship game (27-0) over the Baltimore Colts in 1964 as his badge of honor. He would show it to every Cleveland sports hero he could find, imploring them to give him a reason to add a second ticket stub to his “victory” wallet. That was the thing about LeBron. He’s from here—he should have understood. He too carried the 46-year drought of losing with him in his backpack as he trudged to school from his broken home in the projects of lower Akron. He knew what we needed to lift our spirits as Cleveland slipped from the 7th largest city in the country to the 43rd. He knew he was the “Chosen One” and could deliver us to the Promised Land. Mr. Raab lays out the LeBron story so people who are not from Cleveland can get an inkling of what it really meant when LeBron took an hour of ESPN’s valuable resources to announce his DECISION to shove 46 years of despair right into Cleveland’s face like a cherry pie twisted and turned to make sure every bit of skin was smeared. But The Whore of Akron is about more than basketball and false heroes. Fifty-nine-year-old Scott Raab also invites the reader into his gentle psyche to reveal himself—a Jewish overweight underachiever from a broken home who lived on the streets, fought alcohol and drug addiction, and ended up finding a mentor who recognized his ability to write. This is also the story of fathers and sons. After his parents divorced when he was very young, Raab and his brother lived with his mother, who according to Mr. Raab, was mentally unstable. But to this day, Raab still remembers wrestling with his Dad and the smell of sweat and Old Spice. Those memories linger like a love song in his brain. He recognizes that LeBron never had those memories and how that must have framed him. When Raab remarried in his forties, he and his wife had their first and only child, Judah. Raab’s love for his son is unabashed. He wants to be everything that his Dad was not for him. He wants to create the memories that LeBron could never have had. Most importantly, he wants to be there for his son. Every night before Judah goes to bed, he lies on the floor with his Dad and they talk. More than anything else, he wants to spare Judah the same pain. Question: Do you fault Lebron for leaving Cleveland? It’s not his fault Ohio professional sports are horrific, which is mot to say I likes what he did but I can understand it. It’s the “its all about me” scenario. First thought is who cares, second thought is why do we care, third thought to answer your question is I don’t think anyone should fault someone trying to better themselves, fourth thought is your synopsis is probably correct, fifth thought is when you don’t keep your committments, a larger circle then your own selfish one is affected and especially when it comes to children is tragic especially when you have to look towards media made hero’s inorder to feel good and help define self worth, what a screwed up world we live in, eh? Last thought, shouldn’t we be talking about American Manufacturing? Do I fault him, no. In sports, we have to realize that they have to take care of themselves and ewarn as much as possible during a very short career, by any other standards. But I can understand the reasoning behind not wanting him to go. I am up here in Detroit, and the Lions have had a long streak of no playoff appearances. If we had somebody like oh say Jerome Bettis that landed in his hometown of Detroit and then left, we all probably would have been very upset too. But we can’t complain too much as we have had the Red Wings, Tigers, Pistons, Michigan Wolverines, (and i shudder and find myself disguted by saying this) the MSU Spartans around here to win championships and ease any pain. But the Lions are in the playoffs this year and may even win one or two. Professional sports is a business above all else, and in this era of free agency players will go to teams which pay them more money, or give them a better chance to win championships, than the organizations from which they came. Anyone who’s a fan of professional sports in the 21st century should be wise to this reality and should soothe the pain of losing players by “rooting for the laundry” rather than for individual players. As a die-hard Pittsburgh Pirates fan who saw free agency dismantle a World Series championsihp-caliber team 20 years ago, I know first-hand of which I write. Because the Cavs failed to win a championship with LeBron, it was more painful when he left Clevleand for Miami than it was when Albert Pujols bolted St. Louis for Anaheim recently, as Prince Albert led the Cardinals to a pair of World Series titles. Unfortunately for Cleveland sports fans, neither the Browns, Cavs nor Indians appear to have strong chances of winning a championship anytime soon. who cares, change is inevitable….which was hammered home to me on Christmas Eve..I drove all the way out ( 760 miles) to Indiana with my wife and kids , to spend the Holidays with her family. The only thing that kept me going was the thought of my mother in laws fladlasoupa ( German soup) and duck ( rice stuffing, nice, artery clogging crispy skin) and other traditional German foods. I got ham and baked beans….but I had to deal with it, as does the fans of Cleveland area teams when sports stars leave..
As a native Ohioan I can relate to the Cleveland attitude towards LeBron James. He was like family to us, one of our own, born and raised right here in the Buckeye State. Learned his game here, was drafted here. Ask Michael Jordan if he would have left the Bulls even though he did not win a Championship until several years into his career there or Larry Bird to quit the Celtics or Magic Johnson to quit the Lakers. They have all said that they could never do what LeBron did. He quit the Cavs just like he quit in the playoffs with the Cavs and quit in the last few minnutes of the last game between the Heat and the Mavs. Yes I fault James for leaving Cleveland and quitters never prosper. MVP’s don’t abandon their teams. 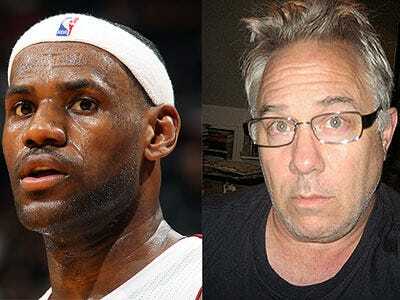 The owner, Dan Gilbert had deep pockets and brought in talent at Lebron’s request. Obviously, Lebron’s popularity has taken a major hit, as well as his endorsement dollars. Bad “Decision”! I recently read the book and I must say it’s an excellent read! I live in Cleveland and remember “the drive”, “the fumble”, “the shot”, “the choke”, and “the announcment” and a miriad of other Cleveland sports dissabpointments over the last 25 years. Do I fault Lebron for leaving…..No, do I think he showed bad form in how he announced he was leaving….Yes. However, the bigger issue with Cleveland sports is the people/fans of Cleveland that still hold on to the ideology of integrity in sports and business that has long since vanished in the world (for the most part). People here say “I would not have left it’s not the “right thing” to do!” well…people in general do not live to do “the right” thing any longer. Baby-Boomers (in general) and the Corporate America they created and ran “the right thing” into the ground years ago lined their pockets, built their big homes, socked away their cash, and raise spoil brat children who now know nothing about accountability and what “the right thing” is. Baby Boomer kids heard the lip service from Mom and Dad who put work and hobbies ahead of being parents and comprimised family and people to “get ahead” in life. This is the true reason America has eroded. The Majority of politicians, business owners, people hold the cash, and making decisions about America are Baby Boomers who are still comprimising “the right thing” to get theirs. So why did Lebron take “his talents” elsewhere? Why not……America is now about getting yours despite “doing the right thing”, he’s just following the example set by the generation before him. I feel that again, this where we ask ourselves about true beliefs. If you as a sports fan believe in a bond between a man and his community then you can understand his feelings of being betrayed. I often have said and we all have beaten the drum many times that when offshoring started we could not beleive that customers could possibly betray the relationships and commerce that were good for both of us and just like Lebron depending on who you are “CAPITALISM” was the fall of what was once his hero. He is not alone, many small buisinessmen sit in chairs, making hard decisions realizing that the times that when buisiness was not based on the poltics of the world is long gone as it is today, then he is acualy very fortunate, another youg player will come of Ohio and one day hopefully make both he and Judah’s dream come true, and when they get that second Golden Ticket. I hope that manufacturing for those who have had the hearts as Amercans learn a lesson about capitalism. It is still the system but we have found that it can and change your spirit when you lose what you had. Why should I care if one of the over paid sports guys leaves a town. He plays a game for money, and some folks pay to see him. the product, that brought the great player to me. It’s a job, not love that makes these guys play. Yes play a game for my entertainment. They can come and go as they please. I won’t loose any sleep. Lebron James plays the game for Lebron James. He doesn’t play for a team or town. It seems Miami too is dissapionted in the purchases they made over the past few years, they were supposed to be a sure win champion team with James and were not. He knows nothing about loyalty or team, he has never been shown these things. I don’t blame him for leaving..that is the way the rules are structured in free agency. What I do fault him for is acting like a jackass on ESPN with THE decision. He turned off a lot of people outside of Cleveland with that. If he would have come out and said that he has given his heart and soul to Cleveland and that Cleveland and Akron still hold a fond place in his heart but it is time to move on…I think he would have gotten 10X less grief..but he did not and now he is paying the price. I support Lebron. Remember, he was very clear that he was from Akron NOT Cleveland. I know exactly what he means. I grew up in Dayton in the 50-60’s and was a heavy follower of the Reds. When I moved to Cincy in the 70’s, I found to my surprize that Dayton might as well have been in Arizona for all the respect it had in Cincy. So Lebron owed nothing to Cleveland. Its not personnel, its business. The difference between Dayton and Cincy and Akron and Cleveland is that Akron and Cleveland are in the same media area. We share the same TV stations and the area referred to as Northeast Ohio (which includes Cleveland, Akron and Canton) is one in terms of sports allegiance. Dayton is a distinctly different media market than Cincy (I lived in Cincy for a while) and therefore, those two markets are seen very differently. The other problem with Cleveland fans is they continue to give their full support to a loser, stop acting like fans and respect yourself as a customer. Stop buying (insert 1st round picks jersey) until they prove themselves. No one in Greenbay, New England, Baltimore, or Pittsburg runs out and buys a jersey of a 1st round pick because they know they seldom see the field in those cities. Stop going to the joke of a “new” stadium Cleveland has now and buying tickets. WHen Jacobs Field (I will always call it that) had a competing winner people sold it out, when the Indians are down…people stopped going. It sends a me$$age to the owner, provide a good product or the customers will not support it. The franchises in Cleveland need an identity, stop believing in players or coaches as saviors. Just look at Bernie Kosar, all he ever did was put up better than average numbers and lose 2 AFC championship games yet he is revered in Cleveland because the “fans love him” and he never had to win anything of value to earn it. Wake up Cleveland fans your mindset is a mjor part of the problem. Why no love for Lebron? He at least got you to a championship series? Well I know that’s a stretch, Im a Cavs fan…..but not unless they earn my fandom first, same with the Indians, and well I follow the Browns but family was from PA so…. Who in the world could possibly be stupid enough to care what Lebron James does? oh yeah, i forgot, sports are still pure. if you could sell an acme for $15,000 in akron and $25,000 in miami, i think i know where it is going. The term “sports nut” has never been more valid. You have a bunch of moron nuts paying the huge salaries of moron whores in professional sports. I think the guy writing the book is a little bit of a whore himself. I don’t fault Lebron for leaving Cleveland to play in Miami. This is “the land of opportunity” and we all must take our own path in life. I do however, fault Lebron for making a spectical of the entire situation. By staging the rediculous show he disrespects the fans that supported him in the past. There was no need for the rediculous show except for Lebron to make more money (and we all know he doesn’t need the money). As a south Floridian and avid sports fan, not to mention an ex Heat season ticket holder, I say to all of you as well as my beloved friends who reside in Ohio, “you can have him back…!” I have never been more appalled at the way this whole “decision” went down. Come on, a televised espn special..??? Give me a break? How big is this guys ego??? This just adds to the bad taste in my mouth from the ridiculous salaries being paid to these athletes, thus not allowing hard working Americans to go to the game in person. It’s always about the almighty buck without the LOYALTY. Blame the fans who pay the outrageous ticket prices. I haven’t watched a heat game since he came here and I look forward to buying Raab’s book. Thanks, Larry. Just a great book review. Remember, Florida has no income tax, along with Texas and few other states. You will see that LeBron is the first of many that well be “relocating” in states that has their pro sport, being played, and without an income tax. Can you blame him for the business decision, heck if I can move my business there, I will in a heartbeat to save on the taxes.